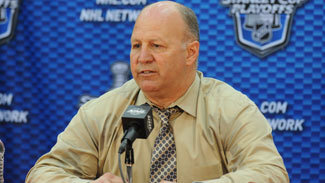 Boston Bruins coach Claude Julien will have a new team and a new challenge Sunday afternoon. He can't wait for it. Julien will become the coach of the Winthrop, Mass., Squirt B team for one game as part of a charity drive benefitting the Boston Bruins Foundation and Massachusetts Hockey. "Maybe it's a win-win situation," Julien told NHL.com on Friday. "They get me to coach them and I get to get some of the rust off." Julien is excited to lend his expertise to the 9- and 10-year-olds fortunate enough to win the "Coached by Claude Raffle," which ended earlier this week after tickets were sold for 12 days at $5 apiece. Julien will send his new team to the ice at 2 p.m. Sunday at Haverhill Valley Forum in Haverhill, Mass. "I was approached by our Foundation and they asked me if I would be willing to coach a youth hockey team that would win in a raffle and that would help raise money for minor hockey in the area and also for our Foundation that always gives money to great cause," Julien said. "It was a no-brainer for me." The Boston Bruins Foundation is a non-profit foundation that assists charitable organizations geared toward children throughout New England. Massachusetts Hockey is a non-profit corporation and an affiliate association of USA Hockey. "Since we can't be doing what we usually are doing right now, this is an opportunity to give back and participate in the community and keep the situation as positive as you can related to hockey," Julien said. "It was an easy answer for me to give them." Julien, who recently dropped in to visit a men's league game in Saugus, Mass., said his goal for Sunday is to treat the kids to the professional experience. "I am going to go there early on Sunday, it's a 2 o'clock game, and we're going to have our strength and conditioning coach do some stretches with them and our equipment trainer help them with their gear," Julien said. "We're going to make it as pro-like as possible. Then I'll come in and give my pregame speech and go behind the bench. And after the game I'll be with all of them. "It's going to be a fun day."